It is stated in the Instrument of Government - one of Sweden's fundamental laws - that the Government "governs the Realm". But if the Government is not accepted by the Riksdag, it may be forced to resign. The Government can resign for various reasons. One such reason is that support for the Government changes after a parliamentary election. In Sweden, the Speaker of the Riksdag has a central role when a new government is formed. It is the task of the Speaker to propose a new Prime Minister as soon as possible who can appoint the other government ministers. The Speaker presents a proposal for a new Prime Minister, which the Riksdag then votes on. The Government may be reshuffled considerably without it being a question of forming a new government. The Prime Minister may replace ministers, transfer ministers and increase or decrease the number of ministers without consulting the Riksdag. A government may remain in office for as long as it has the support of the Riksdag. A government may resign for various reasons. A number of situations which can provoke a government crisis and force the government to resign are described in the following paragraphs. The foundation of the government is changed after a general election.The governing party, or a coalition of several parties, may lose its majority in the Riksdag at a general election. 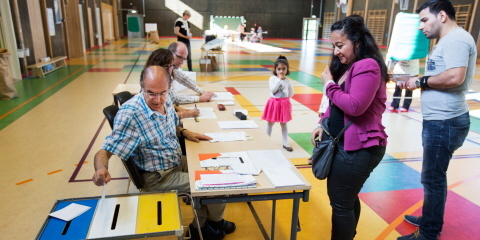 Examples of such situations include the resignation of the non-socialist four-party government after the election of 1994 and the defeats in the polls of the Social Democratic Party in 2006 and for the Alliance Government in 2014. Defeat in a vote of confidence in the Riksdag. At least 35 members of the Riksdag can request a declaration of no confidence directed towards the Prime Minister and thus also the Government. This is known as a vote of confidence. If at least half the total number of members, i.e. 175, vote in favour of a declaration of no confidence, the Government is overthrown. No government has yet been obliged to resign in this manner, but the possibility of submitting a motion on a declaration of no confidence has important indirect implications. Cabinet questions – when the stakes are high. Votes of confidence can also be informal in the sense that a government is forced to resign when it loses a vote on an important matter in the Riksdag. Sometimes a government may deliberately choose to jeopardise its existence by declaring that it will resign if voted down on a specific matter. After having lost such a vote, the Social Democratic Government of Ingvar Carlsson resigned on 15 February 1990. Matters of this nature are known as cabinet questions. When the government is split from within. The risk of a government resigning due to internal strains occurs mostly in a coalition government. The Speaker plays a central role when a new government is formed. Here, Sweden differs from other democracies where the head of state normally has this task. It is the task of the Speaker to, as soon as possible, propose a new Prime Minister who can form a government. The conclusion of this procedure is a vote in the Riksdag on the proposal submitted by the Speaker. Only the Speaker is entitled to submit proposals concerning the post of Prime Minister. When a government is due to resign, the Prime Minister approaches the Speaker, who dismisses the Government. At the same time the Speaker requests the Government to remain in office as a caretaker government. Such a government is meant to deal solely with routine business and not take any political initiatives. A caretaker government is expressly forbidden to call new elections. The Speaker then summons the leaders of all parties in the Riksdag and the Deputy Speakers for consultation. The number and scope of these discussions can vary depending on how complicated the political situation is. The usual procedure is that the Speaker instructs one or several party leaders jointly to examine the possibilities of forming a government which will have the support of the Riksdag. By means of these discussions the Speaker has a basis on which to judge which candidate the Riksdag might be prepared to approve as the new Prime Minister. After every election the Riksdag elects a Speaker. If there is a change of official, it is the task of the newly-elected Speaker to submit a proposal for a new Prime Minister. In order not to lose time, it is assumed that the retiring Speaker will prepare the change of government by starting discussions with the party leaders immediately after a government has resigned. The retiring Speaker is thus competent to dismiss a government and to request it to remain as a caretaker government. 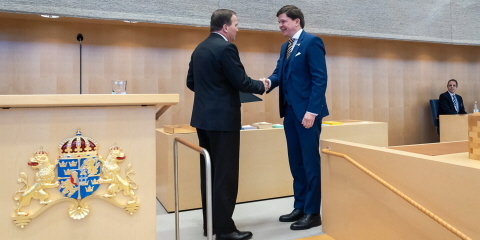 The Speaker presents his or her proposal for a new Prime Minister to the Riksdag and states at the same time which parties should be included in the government. The proposal is tabled without debate. The Riksdag then proceeds to vote on the proposal in the Chamber. The vote is not preceded by a real debate. Instead representatives from the different party groups state their positions before the vote is taken. The vote is, as other votes, open. This means that it is possible to see how each member has voted. An explicit majority for the Speaker's proposal is not required. Instead, the rule is that if more than half the total number of members, i.e. 175, have voted against the proposal, the proposal is rejected. Otherwise it is approved. If the Speaker's proposal is rejected by the Riksdag, the procedure has to be resumed and a new proposal presented. The Speaker may make a total of four proposals. If he or she does not succeed in getting any of these four proposals approved, an extraordinary election must be held within three months, unless an ordinary general election is due to be held within the same period of time. Using this procedure, it has not been necessary for the Speaker to submit more than one proposal. The Riksdag has, in other words, always accepted the first proposal from the Speaker. The possibility of submitting up to four proposals should be considered as a last resort not intended to be used. After the proposal has been approved by the Riksdag, the Speaker issues a letter of appointment for the new Prime Minister. It is the task of the Prime Minister to determine the composition of the government. In connection with their appointment, the Prime Minister informs the Riksdag of the names of the people he or she has appointed. The change of government takes place at a special meeting known as a Council of State, with the Head of State, the King, presiding as chair. The Speaker is present at this meeting and gives an account of the proposal and the decision of the Riksdag. The King then verifies the fact that a change of government has taken place. The newly-appointed Prime Minister delivers a Statement of Government Policy to the Riksdag. In this statement, the Government presents an outline of its intended policies. It is usually delivered at the same time as the Prime Minister announces the composition of the Government. The Riksdag arranges a debate between the party leaders one or two days after the Statement of Government Policy has been delivered. A government may be reshuffled considerably without it being a question of forming a new government. The Prime Minister may replace ministers, transfer ministers and increase or decrease the number of ministers without consulting the Riksdag. If a reshuffle involves a coalition government and results in the foundation being changed due to the fact that all ministers from a certain party resign, the situation becomes more complicated. When the Riksdag takes a decision on a proposal for a new Prime Minister, this decision is based on the fact that the Speaker also communicates which parties will be included in the Government. The approval of a new Prime Minister is made by the Riksdag after these circumstances have been taken into consideration. This has resulted in the practice that a government must resign if its foundation is decreased due to the fact that a party has left the Government.